Construction is well under way on the Children’s Museum’s Sports Legends Experience, due to open on March 17. The intersection of Delaware Street and Fall Creek Parkway was long known by locals as the “Spider” because of all the legs of asphalt and the confusing signals with no pedestrian crossings. With a major redesign completed, this has all now changed. Traffic safety has been improved by reducing the number of northbound lanes and eliminating the Talbott Street and Washington Boulevard “legs” of the Spider, with the resultant simplification of traffic signals. Four crosswalks and additional sidewalks have improved pedestrian safety. Even bicycle safety was improved, as the electronic devices which detect cars also detect bicycles. The “Wrong Way” and “Do Not Enter” signs were removed and Silver Fall Park was made much more visually appealing with the planting of flowers and trees. What amazed me was the complexity of the project involving the City-County Council, the Dept. 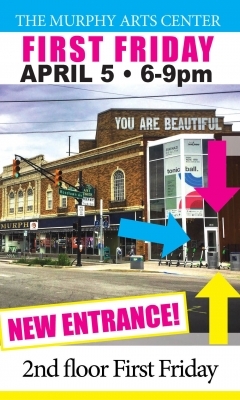 of Public Works, Citizens Energy, the Mapleton-Fall Creek Development Corp., Keep Indianapolis Beautiful, St. Richards School, Reconnecting to our Waterways, sculptor Scott Westphal, the Central Indiana Community Foundation and, of course, Destination Fall Creek. Coordinating that many groups was challenging. The Children’s Museum of Indianapolis has long taken a leadership position in our area, having convened the Mid-North Quality of Life Plan and the Neighborhood Development Working Group. The latter group meets six times a year with the clear goal of coordinating and supporting the various neighborhood activities and projects. Destination Fall Creek would not exist without their support. 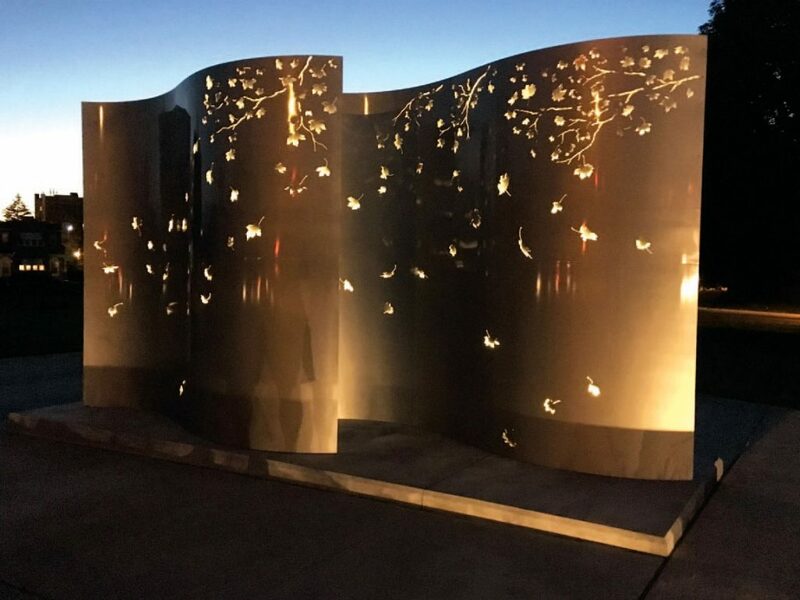 Scott Westphal’s Silver Fall sculpture (shown at night) is the centerpiece of what we now call Silver Fall Park. 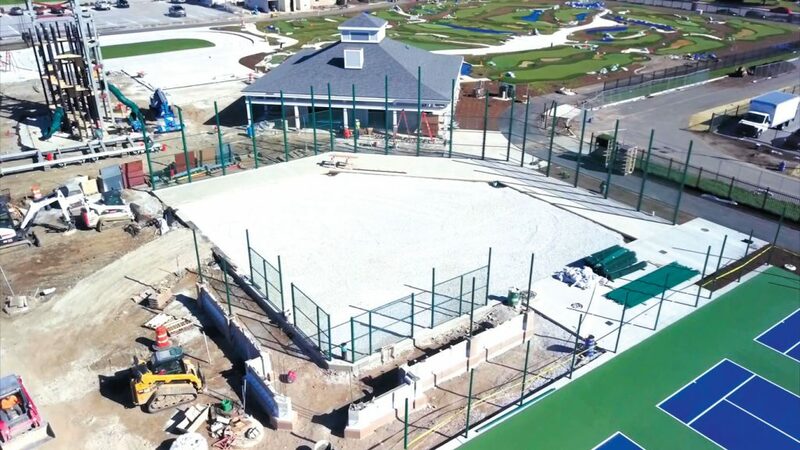 After years of planning, with lots of neighborhood participation and fundraising, the museum is now halfway done with the Riley Children’s Health Sports Legends Experience – a new 7.5-acre indoor and outdoor experience that will allow children and adults to immerse themselves in a variety of sports environments, including golf, baseball, tennis, football and even drag racing. The two major bridge projects have moved forward. 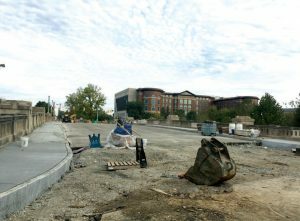 The Capitol Avenue bridge is nearing completion. The Central Avenue bridge has been torn down. While these projects have been an inconvenience, both bridges had become safety issues and needed to be rebuilt. Because they are historically designated, federal law requires them to look substantially the same. We will be proud of these bridges. Many other Destination Fall Creek projects have moved forward but are still in the early development and planning stages. 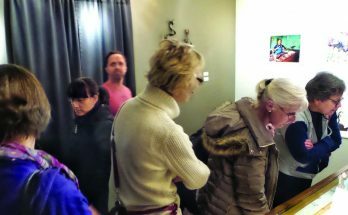 A 49-unit apartment building, called The Overlook at the State Fair, is now fully occupied and a great success. On the east side of the building a 28×40-foot mural called Fall Creek Canvas has been well-received by local residents and passers-by. We look to add lighting to make it more visible at night. 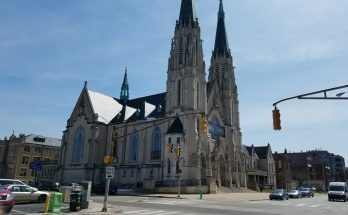 Keep Indianapolis Beautiful recently awarded a grant to plant a community orchard between Central Avenue and Delaware Street on the south side of Fall Creek. Jason Kizzia is leading this effort with the support of numerous Fall Creek Place neighbors. Going forward. While we have accomplished much, some projects remain to be developed. 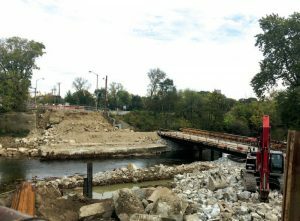 The College Avenue bridge required a complete reconstruction, meaning that vital thoroughfare will be closed for a while. There is a 26-acre abandoned rail yard, just south of 38th Street and east of the creek, owned by the Norfolk Southern Corp. The land was given to the railroad over 100 years ago in order to get the railroad to build the rail line. Back then, getting a rail line in your area meant economic growth. Currently, Norfolk Southern pays no taxes whatsoever – and the land costs them nothing. They have little incentive to do anything with the rail yard. Steam locomotives used to dump their coal ash on the tracks. Coal ash is high in heavy metals, such as lead and arsenic, causing environmental issues. The yard completely closed 20 years ago. We would like to see this land, located right on Fall Creek, developed as mixed-use, high density residential and commercial property. 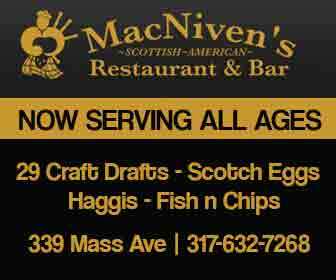 It is above the flood plain, would have great views of Downtown Indianapolis and is just across the creek from the State Fairgrounds. This would have a huge economic impact on the area. A class of landscape architect students from Ball State University created compelling plans for the abandoned rail yard. This is a transit-oriented development with a lot of bus and trail access. To create auto access we will again need help from the city. The potential for increased tax revenue alone should justify this help. There are numerous undeveloped parks along Fall Creek. The entire west side of the creek is park land. Charles Williams Park is located on the south side of the creek just west of the Monon Trail in the Crosstown neighborhood. Steps are being taken to develop this park, but we need help from the city to make the park a reality. There is an old abandoned building called the Omega Center on the east side of Fall Creek just north of 30th Street. The property offers the most picturesque vantage of Fall Creek anywhere. Currently owned by a church, which pays no taxes, it could be a lot of things – but the building definitely needs to be razed. There are two apartment projects on hold near Silver Fall Park. One is Central@29 and the other is Fall Creek Flats, totaling some 200 apartments plus retail space. Both have financial challenges and need help from the city to move forward. Finally there is an open space just to the west of the Overlook Apartment building and east of the Creek, which could be developed as a gateway to Destination Fall Creek. Conclusion. My real point in this series of articles about Destination Fall Creek is to say that anyone can effect change. I moved to Mapleton-Fall Creek and slowly expanded my reach and grew to know more and more people. I never missed an opportunity to pitch Destination Fall Creek to anyone. I listened. Almost every idea was borrowed from someone else. Great people seemed attracted to Destination Fall Creek and I was always blessed with good ideas from others. I have absolutely no official power in any of this effort. I am just a neighbor trying to make this a better place to live. I am often asked, “Why does anyone listen to you?” My answer is that people who do have power are looking for positive people with a vision of how things can be better. A really good mission statement helps. Then create a plan that supports that mission statement. Good visuals help. And you must know your story – cold. Never give up. Destination Fall Creek has been a six-year process. Things go wrong. Good people quit. Never give up. Did I already say that? Chuck Madden of the Mapleton-Fall Creek Neighborhood Association, said, “Destination Fall Creek has been a force for real improvements in our historic neighborhood.” We now have some $90 million in projects in Destination Fall Creek. 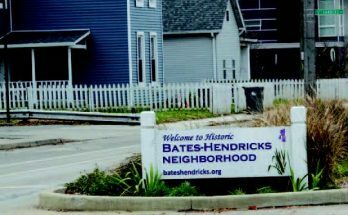 We have held the collective goal to improve our part of Indianapolis. We come together to make this a better place to live and stand as proof that change is possible with the right vision and energy. Start something or join a team and work on something. The impact can be amazing.